Synonyms: Our Heroine is Saved So Much that the World Becomes a Little Apocalypse! ?, Ore ga Heroine wo Tasukesugite Sekai ga Little Mokushiroku!? It's not long after this encounter that his troubles begin. His childhood friend Satsuki invites him somewhere, possibly to confess her feelings for him. However, before she can, she's kidnapped! Rekka wants desperately to help her, but he finds himself being tossed into various sci-fi and fantasy worlds, each with their own heroines in trouble. Will he be able to get back to Satsuki? Will he be able to save all the others? How can he really tell the consequences of his well-meaning actions? 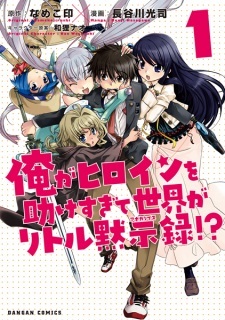 Alternative version: Ore ga Heroine wo Tasukesugite Sekai ga Little Apocalypse! ?